Meerkats have captured the Nations heart in many ways recently and their cheeky disposition brings a smile to everyones face. The large figurines take a light hearted look at some of the most illustrious meerkat heroes through the ages! They are approximately 10 inches high, very imposing and so amusing. 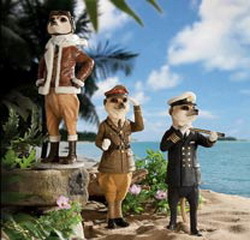 The Mini Meerkats are approximately 6 inches high and take a light hearted look at some of the professions and characters we love and cherish. They bring a smile to everyones face and are a very affordable gift for your friends and family. Start your own meerkat collection right now. Meerkat Dads - Anyone can be a father, it takes someone special to be a dad. Meerkat Dads - Dads make the world a better place. Meerkat Gardeners - I've spent most of my time in the garden.....the rest I've wasted !